The man, the myth, the legend. This is a joking phrase that I use when referring to my husband. But those words have a lot more meaning now. For those who don’t know me, I’m Jessi Mart, Al Mart‘s wife, keeper, supporter, late night track chef and part-time umbrella girl. I’m the other component of the Twisted Drag Team. 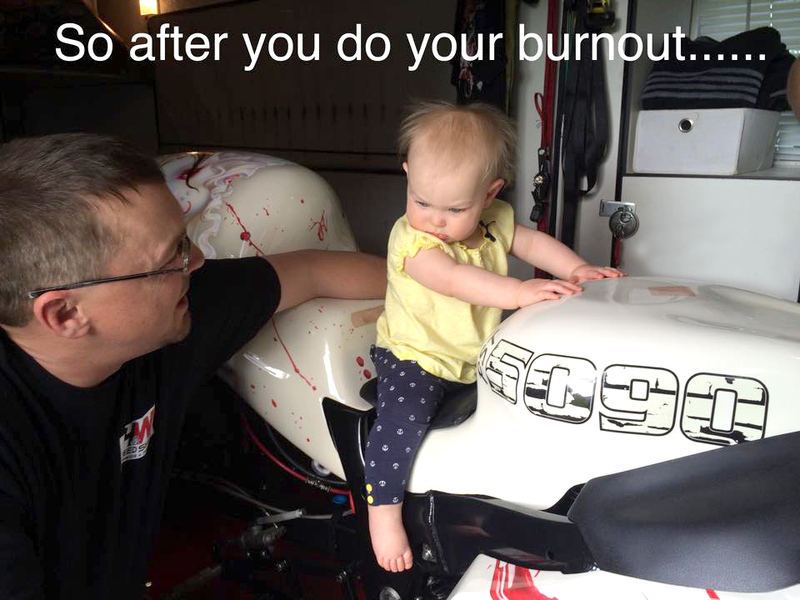 My position as a racer’s wife is support staff and also anything our team needs. 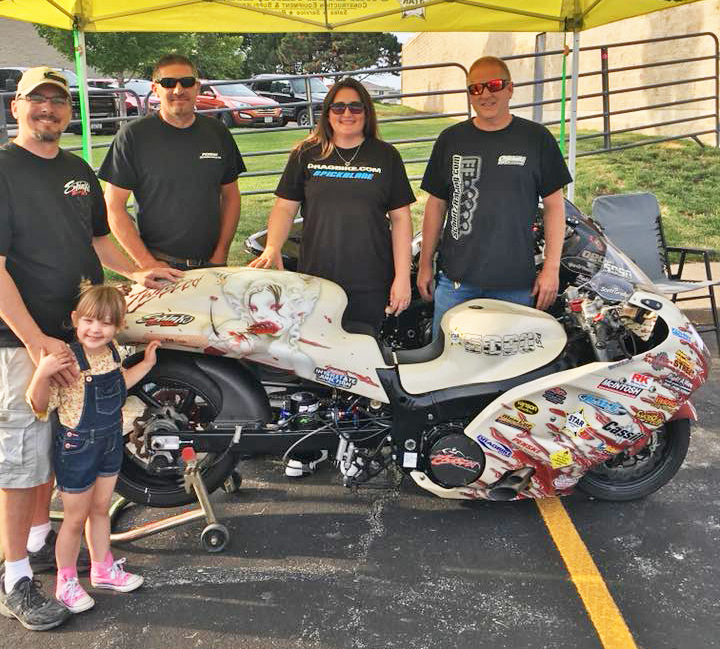 We are a family in the Twisted Drag Racing camp and that has indeed proven its self to be true during the last couple of months. Many of you have heard of the struggles that my husband has gone thru with his health these last couple of months. I am here to tell my side of things and how our race family has lifted us up and supported us in the toughest times of our lives. I could go back to five years ago when Al had his heart attack, it was the beginning of this crazy health journey. Once he had his heart attack, it set into motion seven heart catheterizations over the course of five years and seven stents in his heart in a matter of 18 months. His heart attack was deemed a “widow maker,” and yet he is still here. (Remember the man myth legend, just wait it gets better). 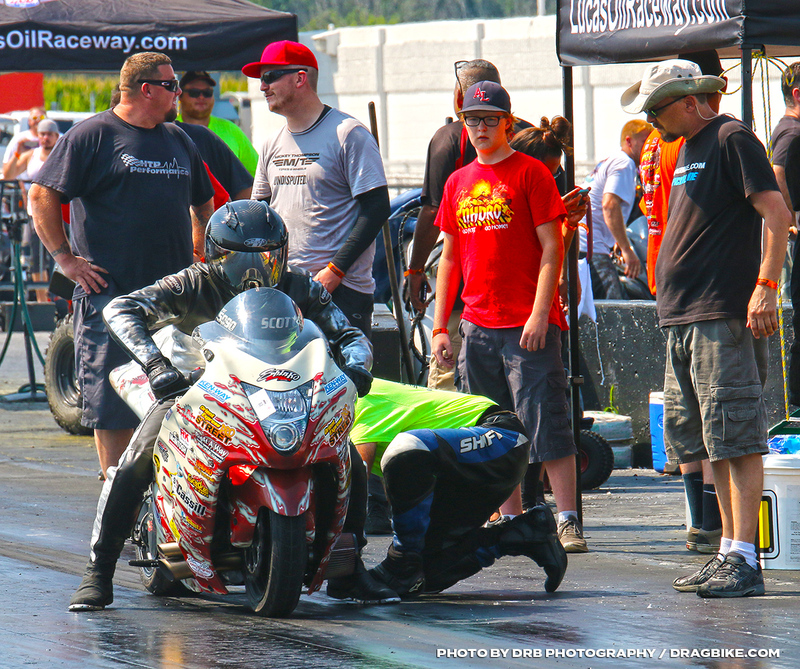 Not only is he still here, he was racing our Pro Street bike named Twisted 3 weeks after his heart attack. Who does that, oh yeah, Al Mart. Also, remember that one year where he blew up his nitrous motor at the beginning of the season and had a turbo by the end. Yeah, he’s a little twisted. And, that primarily took place due to Scott Grady, a fellow teammate. This past October Al had some heart issues and some other odd issues. One of those was a headache, a nagging headache. 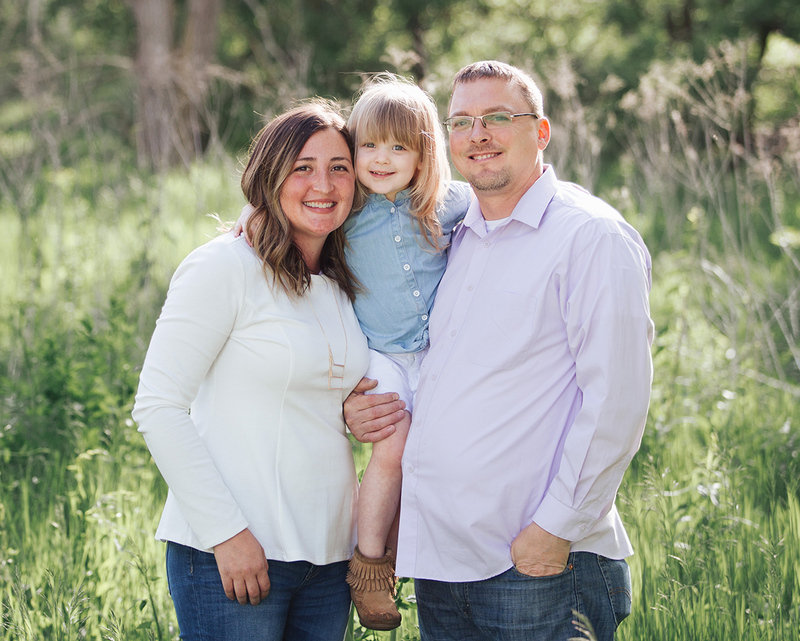 His family doctor ordered some imaging and to our surprise, there was an aneurysm. That was a gut-wrenching phone call. I remember Al calling and telling me what his doctor had said. Typically an aneurysm is not found this way-they are usually found in an autopsy or from a rupture. So off to the University of Iowa we went to meet with a neurosurgeon to do an angiogram to check things out. 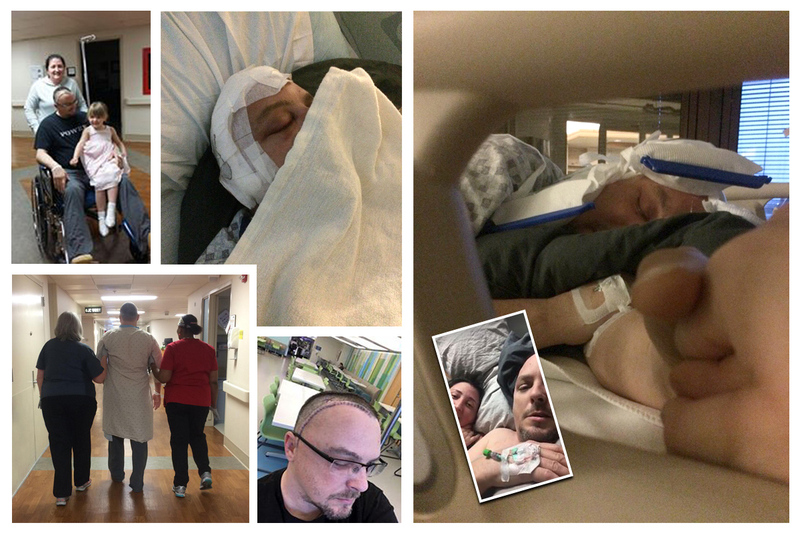 At that time it was too small to fix, but five months later he ended up in the ER with the worst headache of his life. At that time they realized that an aneurysm had grown roughly 30%. The neurosurgeon gave us two choices-easy or tough. Being the guy, Al is, he chose the tough route (craniotomy) because it was a more “permanent “ procedure. For those of you who don’t know what a craniotomy is-they cut your scalp for the top of your head to the top of your ear. They open up your skull to be able to get into your brain and find the area to fix. We knew the surgery was going to be tough, but there was nothing that would have prepared us for what came next. Friday, April 20th-was the day. The night before we loved up on our daughter Bailey (who I was pregnant with when Al had his heart attack) and tried to get rest. We had an early call time that morning. One of our teammates Scott Grady (the new pilot of Twisted) was there the entire time during surgery. I know he was in constant contact with our other teammates- Glen Aubrey (Crazy 8s/Street ET/clutch master of Twisted), Strad Dighton (Street ET/support crew of Twisted), and Kevin Graham (Street ET). The surgery lasted every bit of five hours. We knew that Al would be in ICU for a short time after surgery. I was able to speak with the surgeon afterward. He told me the aneurysm was tissue thin which means it wasn’t IF it was going to rupture…it was when. Not only was the procedure a difficult one because of the nature of his aneurysm, but it was also not in the exact spot the surgeon thought. So long story short, he had his work cut out for him. Because it was so difficult to put a clip on, the surgeon wanted to do an angiogram the following Monday to make sure that everything was holding steady before we were released. The plan was to stay in ICU for a day or so and then head to the neurology floor for the next couple of days while he recovered. The best way to describe his first day coming out of surgery was like a newborn when they sleep a lot and are awake for a short time. So as the day went on it would shift to less sleep and more alertness. This is also the day that Scott and Strad showed up at the hospital with shaved heads in support of Al’s new haircut. When I walked into the room and saw that, my eyes filled with tears. That shows you the level of friendship that these guys share. It was amazing. We got moved to the neurology floor later that day, and Al was able to walk. He was doing well, but it was still a rough recovery. One of our daily visitors was Scott. He was there every single day we were at the hospital. And, what happened that Monday night during his angiogram, I could not be more thankful that Scott was there. To date, it was on the roughest and worst nights of my life. Monday the 23rd at 8:30 pm-they took him for the angiogram. One of the doctors came out 45 minutes later and told us, they had to place a stent to help support the clip because they weren’t happy with how it was holding. At this point, it was 10:30 pm, I was on the phone with my mom when the doctor came back out. It had only been 20 minutes after he said things were fine. You know it’s not going to be good news when they come back out. He informed us that Al had become paralyzed on his left side and that they rushed him to an emergency CT scan to check for bleeding and gave him a bunch of blood thinners and he seemed to be responding well. They were taking him to ICU to monitor him. We rushed down to ICU and waited. They wheeled him by, and I kissed him and told him that I loved him. In true Al Mart fashion, his response: “I love me too”. That set my mind at ease, his sense of humor is still in there. Then the next 53 minutes Scott and I waited outside while they got him settled. How I even waited that long, I don’t know. Finally, we were ushered back to his room. There was a couple of doctors in there. Al asked if I could get him a diet Mt. Dew (typical Al, remember the support staff…even in times like this) I went up to him and asked him to look at me…that’s when things went from bad to worse. He didn’t know where to look. His right eye was swollen still from surgery, and his left eye didn’t know what to look at. It had a wild and scared look to it. That’s when they realized that he had become paralyzed on the left side again. This is now what we know to be when he had his stroke. They proceed to do the protocol of checking his neuro signs. His left side didn’t respond at all. They touched his face…couldn’t feel it. Couldn’t squeeze their hand….couldn’t raise his eyebrows. At this point, it was roughly midnight. The next two things they did were the hardest things to watch. First, they asked him to bend his knee, but he couldn’t, and then they put his left hand in front of his face and said whose hand is this, “I don’t know not mine” was his response. What came next was a blur, tears, explaining what’s next, handing me a consent form to sign to do yet another angiogram to correct the issue at hand hopefully. I remember telling the doctor that I wasn’t going to sign it because I had already done that and look what happened. They rushed him back to the operating room, while Scott and I waited in the ICU waiting room. It had to be 1:30. We had all been up all day. Finally, around 2:30 and the doctor (the same poor doctor who had to keep telling us bad news) he said that they were able to pull the blood clots out of his stent that was causing the stroke and that he was doing well. This does not happen often. In fact, we found out later that Al is 2 of 600 similar cases that this has happened to (remember when I said it gets better, clearly they don’t know whom they are dealing with) We didn’t know what we were walking into and it was an amazing sight. They were asking him to do all the neuro testing, and he could do all of them with his right AND left side. He had recovered! I think it’s safe to say Scott and I both let out a huge sigh of relief. By now it was 3:30 am Tuesday morning. Every hour on the hour the nurse came in to check his neuro signs. Raise your eyebrows, smile, squeeze my fingers, etc. Every hour he got stronger. That next night they took him off his IV blood thinners and then it became a waiting game. The doctors said that if something was going to happen, it would be then. They wanted me to observe him because I would notice a facial change quicker than the nurse. So I told him, “if you never listen to me again in our lives, please do now.” So we checked and checked and checked again. (Kind of like the bike before a pass) He did great. I remember Scott and Strad came to visit and Scott said it was like walking back into a nightmare after the night before. Once we got back to the neuro floor, Al had to lay flat on his back for 6 hours. He didn’t have a grasp on everything that had happened. His memory was rough at this time, so we had to explain a lot and often. He was finally able to get up, who knew watching him walk to the bathroom would make me cry. Therapy came in and had him do some walking, and he did amazingly well. His balance was a little off at first, but his right eye was swollen shut and had been in bed for two days straight. Not to mention he had a stroke. So over the next couple days, we had more visitors and lots of rest. The doctors were impressed with his recovery. His initial surgical site was doing well. His right eye was still pretty swollen. That Thursday we got word that he would need to go to an inpatient rehab facility before he could go home. Luckily there is an excellent facility in one of our local hospitals so we would be close to home. So over the weekend, we were able to break him free from this room. Kevin came up to visit and was ready to go to lunch with us along with some other friends and co-workers. It was great to get him out of the room and get a different view. Scott and Strad were down often over the weekend as well. Scott even picked up a pizza from one of Al’s favorite pizza places. They even shared milkshakes from the hospital cafe. To watch their friendship during this was amazing to watch. I will forever be grateful for Scott during this time. We were finally able to see our daughter Bailey on Monday, it had been twelve days. I hadn’t left the hospital since we had gotten there for surgery. It was a great reunion. I was worried how she would react, but she is tough like her Daddy and didn’t miss a beat. Glen was also able to visit that night as well. It was great for him to see how well he was doing. Finally, Tuesday, May 1st we were able to get to the rehab center. Once we got settled into the rehab-they got to work right away. Al had occupational therapy, physical therapy, and speech therapy. 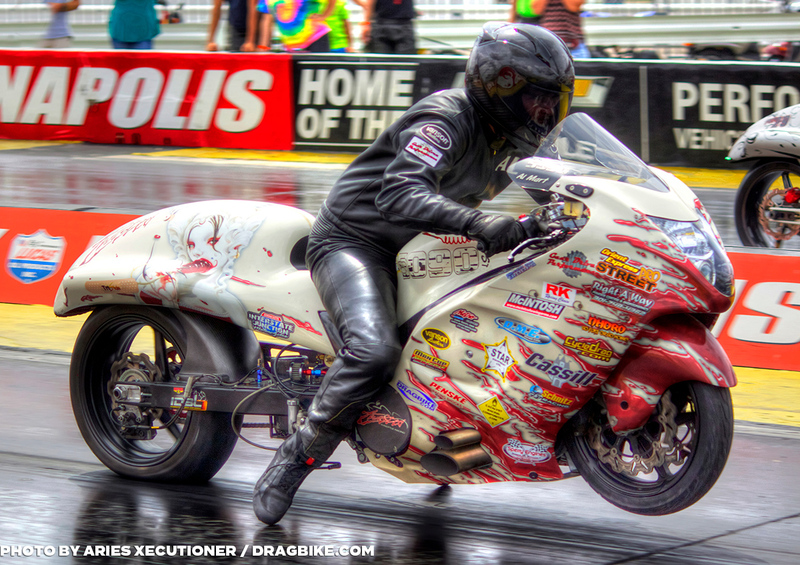 They all asked what do you do for fun….ummmm drag race motorcycles. You should have seen the looks he got. So then once they found how fast it went, they said he was crazy or twisted. The improvements that I saw over the next six days were incredible. To see how far he had come, it was nothing less than a miracle. The therapists all enjoyed Al’s sense of humor and were also impressed with his drive to get better. Finally, after 18 days, Al got to come home. Our new normal started. Al had to be under 24/7 care and had physical and occupational therapy twice a week for eight weeks. No driving and no work. 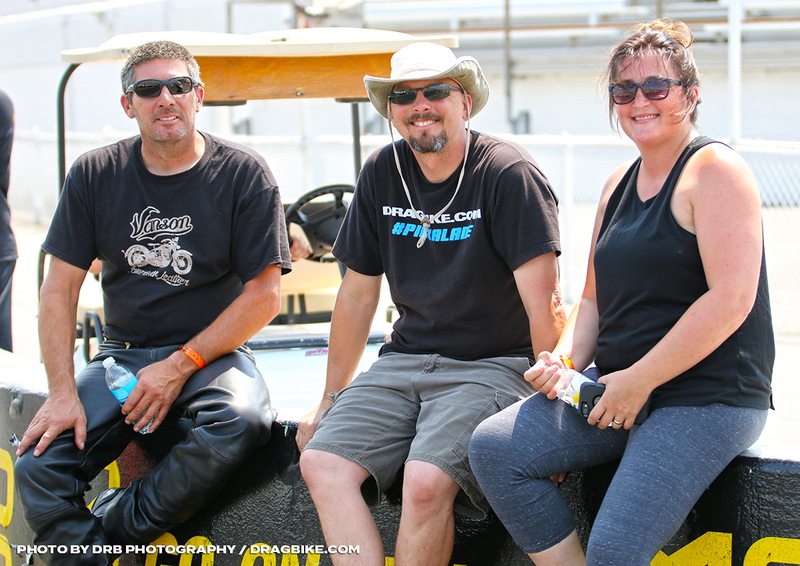 A significant driving force in his recovery was getting back to racing. He knew he wouldn’t be able to ride Twisted but still wanted to participate. 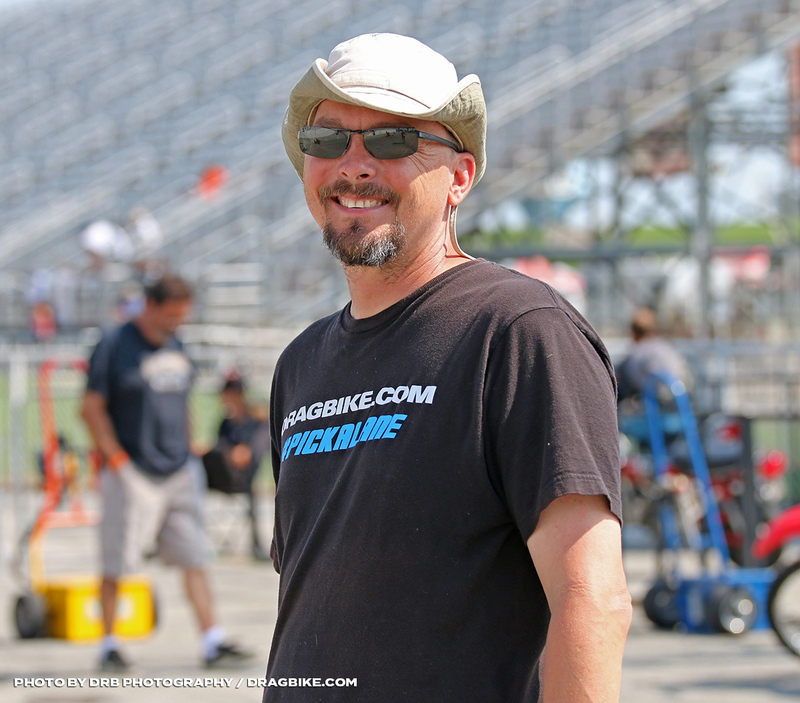 After lots of conversations, it was decided that Scott Grady was going to be the new pilot and he would make his debut in St. Louis in June for NHDRO. Al wanted to be there. We had been to a local track to watch Strad ride his first fast bike, and Al wanted to be there. It was a short stay, but he wanted to be there to support his teammate. So the trip to St. Louis was going to be a real test. 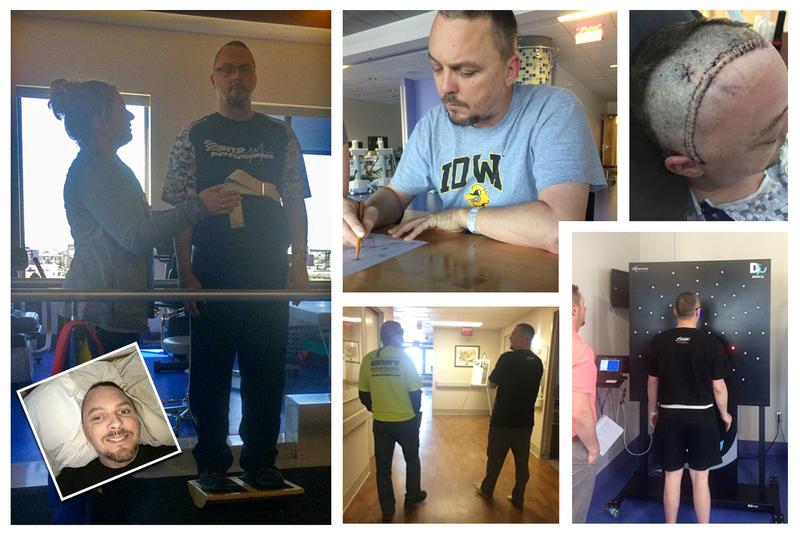 He was only weeks out from his stroke and surgery, but there was going to be no stopping him. Many of you saw Al in St. Louis, and he was welcomed with so much support and amazement at how well he was doing. He felt good, and it was great to see him back in his element. Of course, I was worried about the heat, noise, too much going on, and much more. But all he wanted to do was to be apart of the action. His position on the team had changed. He was now the tuner only and was no longer riding, but the numbers speak for themselves. 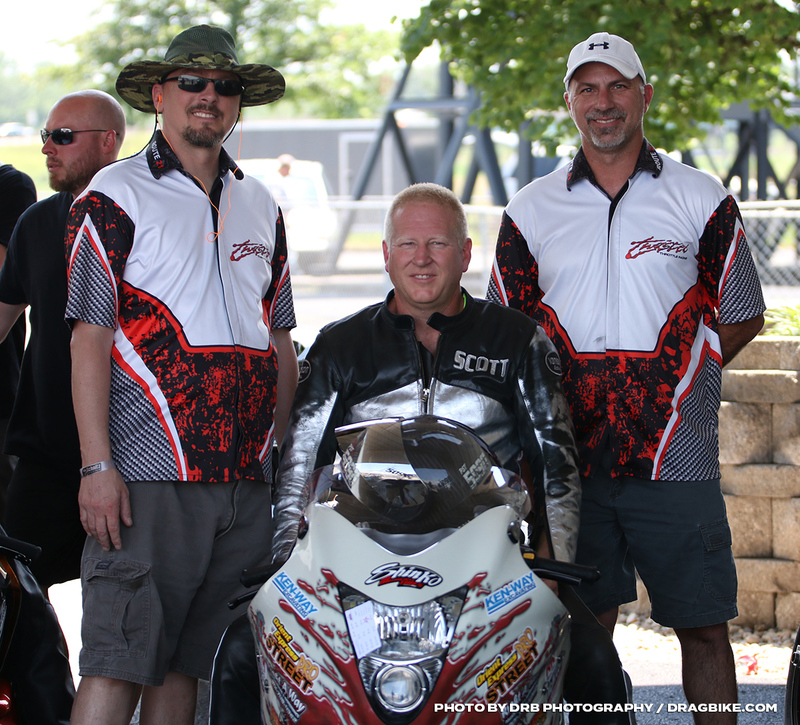 Scott ran the quickest pass Twisted has ever made….7.20. It was a tremendous team effort to make that happen. Finally, after six weeks, we did our follow up with the surgeon – he was pleasantly surprised to see how well he was doing. He informed us that the rupture was imminent. Those words sent chills down my spine. If Al hadn’t made the decision that he did, he might not be here. He was released to go back to work which was a great relief. Over the course of the next couple of weeks, he got stronger and stronger. Then on July 15th, Al threw his leg over one of his teammates Street ET bike at our local track and took it down the lanes (twice). You know that had to feel good. I was a nervous wreck but knew it was what he needed to do. I don’t think you will see him on Twisted anytime soon, but you never know. I want to thank everyone for the overwhelming support during this time. The racing community is such a fantastic group of people. 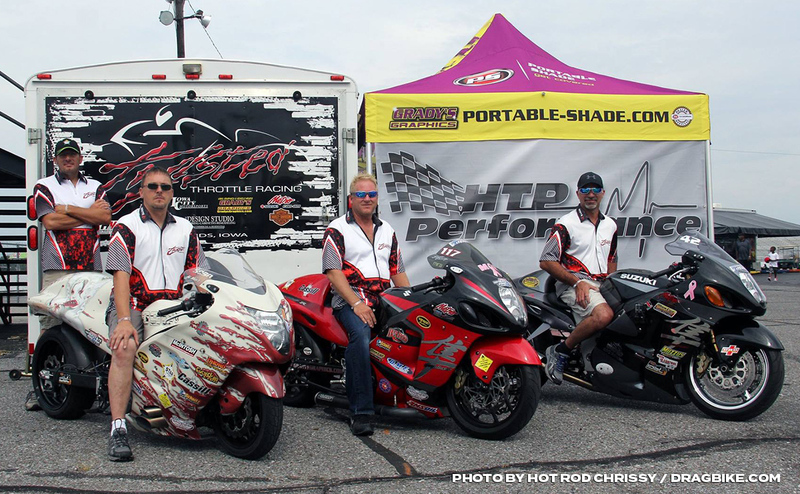 Our team Twisted Drag Racing – those guys are nothing shy of the best. I know that this story isn’t over but hopefully we can finally close this chapter.